Munich bike tour depart every day at 10 am from April to min-October. Visit outside of the peak summer months (June-July) to avoid crowded attractions. We are comparing Munich Bike Tour Prices from leading ticket suppliers and Try to find you Cheap tickets prices on the market. Munich is one of the best and safest city's in Europe for cycling, with wide cycle lanes and pedestrianised areas, and it's pretty flat too. With the help a local city guide you'll spend 3 fun-filled hours discovering the perks and quirks of the city. Starting at Munich's central train station your guide will lead you through the history of the city, hear the part played by King Ludwig II in the Munich's development, the decimating effects of the second world war and on it's progression to a 21st-century city. You'll make stops at the elegant Odeonplatz and Konigsplatz, admire the neo-classical architecture and learn why it came to be known as Munich's Acropolis. This is a leisurely sightseeing bike tour, therefore, your route will continue to the Royal Gardens and onto the English Gardens, the largest urban park in Europe, where you can take a break in an authentic Beer Garden and enjoy a local German beverage under the Chinese Tower. Back on the bikes you'll follow the banks of the River Isar to Munich's well preserved Old Town. For the last part of the the cycling experience you guide will lead you through the historic streets surrounding Marienplatz, this pedestrianised area is the social hub of the city and take the time to point out the best cafes, restaurants and attractions as you cycle through the medieval streets. This 3-hour bike tour is ideal for visitors who have a limited time in the city and want a comprehensive introduction to the city. Munich bike tour will also appeal to people who prefer an active sightseeing tour to a standard bus tour. Suitable for individuals, small groups, and children. Your Experience With Munich Bike Tour? Discover the Bavarian capital on a fully guided city tour by bicycle. Learn about the history of Munich and get tips on how to spend your time in the city from an expert local guide. Enjoy an active tour visiting the city's Old Towns, English Gardens, Chinese Tower, Odeon Square and Konigs Square. Stop at many of the city's major landmarks and explore the lesser-known areas. Sip a local beer in the city's Beer Garden in Europe's largest city park. What Munich Bike Tour Includes? 3-hour city tour by bike. Use of fully equipped bicycle for the duration of tour. The stop at Munich's Beer Garden is dependent on the weather, to avoid missing this you can check the weather in advance or book your tour during the summer months. Arrive in advance so that you can get familiar with your bike before beginning the tour. Travelers Reviews about Munich Bike Tour? 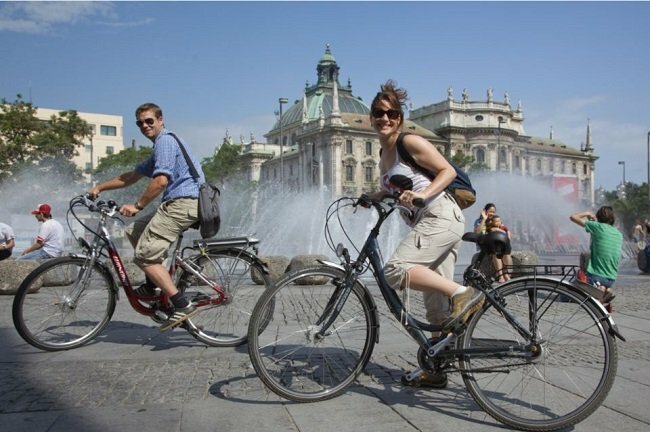 Munich bike tour has an impressive 5-star rating from travellers on TripAdvisor, the tour is provided by Radius Tours, a leading local company Munich. Feedback for this tour is very positive and most comments mention great tour guides and a covering a lot of the city. Minor criticisms say that there is not much time at each stop so this tour is better for people wanting an overview of the city rather than a detailed historical tour. You will receive instant confirmation of your booking via email. Tickets are refundable up to 72 hours prior to departure. Tickets from Viator are fully refundable up to 7 days in advance, a 50% charge of ticket price will apply for any cancellations made 3-6 days in advance. Seats for infants are available for a surcharge, you can organise this on arrival to Radius Tours Office. Please check the weather forecast and come prepared, this tour will operate in wet and dry weather. Visit to the Beer Garden may be cancelled on rainy days. Meeting Point: Please go to the Radius Tours Office, opposite tracks 32-34 of Munich Central Train Station, Hauptbahnhofplatz, Munich.